Due to the extensive work put in by the jailbreak community, we’ve the luxury nowadays of a tether-jailbreak being released simultaneously to the update, and Apple’s latest and greatest version of iOS is no exception. Those of you who have – or are planning to – upgrade to iOS 5 might be pleased to learn that it can be jailbroken (tethered for now), allowing you to add all of those hacks and tweaks you know and love. It has been queried on numerous occasions, with Apple going the whole nine yards in terms of updates, as to whether there would even be any need to jailbreak anymore. After all, unless you’re simply stealing apps and games, most of the Cydia tweaks regarding Safari, notifications, SMS etc have all been improved upon, right? Well, while the improvements may appease many into sticking with stock, it’s important to remember that there are some jailbreak apps that just won’t make it to the Cupertino company’s default software bundle. SBSettings is a prime example, bringing control of your iDevice’s vital features using a simple activation method. Step 1: Download and install the new iTunes 10.5 on your Windows PC or Mac. Connect your iOS device with your computer and make sure you make a backup of everything. Step 3: Download the new Redsn0w 0.9.9b5 for Mac or Windows. Step 4: Once you’ve installed Cydia, you will need to boot the device into a tethered jailbroken state. Go into DFU mode, and then in “Extras”, opt for “Just Boot”. Redsn0w will subsequently boot your device as tethered. Note: Due to the nature of this jailbreak, you will have to repeat this booting sequence every time you wish to reboot your device. If you rely on a Gevey SIM or Ultrasn0w (for old basebands only) unlock, DO NOT update to the stock firmware update offered by iTunes. Instead, use this latest version of Redsn0w to cook a custom firmware file without the upgraded baseband so that you can unlock it with Ultrasn0w or Gevey SIM. To do this, click on “Extras” option and then select “Custom IPSW” option. 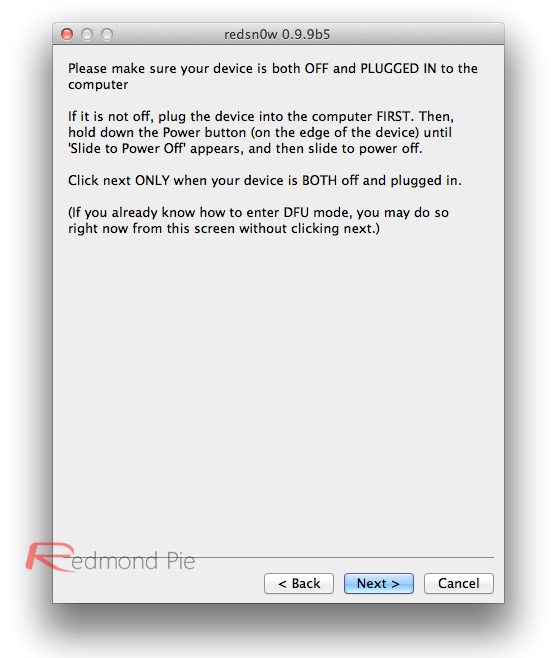 Select the required iOS 5 IPSW firmware file, and let Redsn0w make the custom firmware for you. Once done, enter Pwned DFU mode by selecting “Pwned DFU” from Redsn0w’s Extras option, and then restore to this custom firmware using iTunes. Once done, unlock your iPhone using Gevey SIM, or the updated Ultrasn0w. Alternatively, unlockers can also use Sn0wbreeze for jailbreaking iPhone on iOS 5 with preserved baseband. This video was shot when iOS 5 GM was released. Today’s public iOS 5 release is exactly same as last week’s GM release. If p0sixninja’s revelation at MyGreatFest, backed up by i0n1c’s recent tweets are anything to go by, we could have a very swiftly released untethered jailbreak. Without giving too much away, i0n1c told us that an untethered solution was "covered", so we now await news from the Chronic Dev Team – the group behind the Greenpois0n 4.2.1 – with great excitement and anticipation. 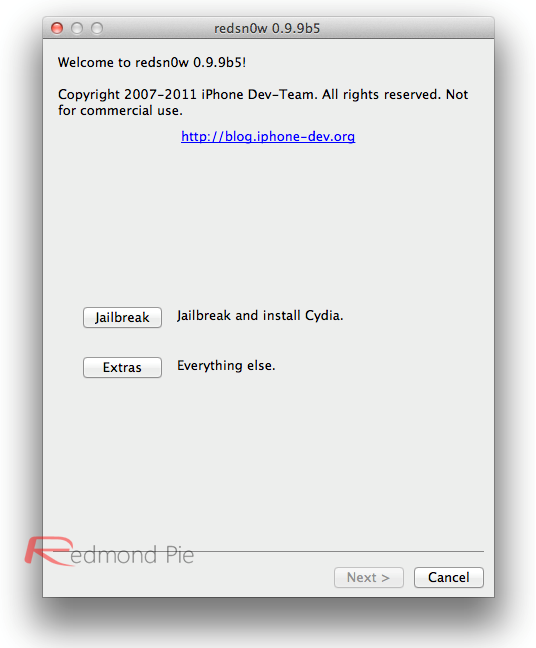 If and when iOS 5 gets an untethered jailbreak, we’ll have it covered from top to bottom here at Redmond Pie, so stay tuned! UPDATE x1: The new Redsn0w 0.9.9b7 for both Windows and Mac brings much faster jailbreak by “no longer stashing the application” during the jailbreak process. This has helped in reducing the complete jailbreak time by 60% (from 210 seconds to 80 seconds). We have updated the above download links for Redsn0w.